The Poinciana tree is the jewel of Madagascar that has traveled to Brisbane QLD and graced the streets and backyards with great beauty. It is popular as a shade tree that bears orange and red flowers. Poinciana tree has been part of Brisbane for decades, and it is evident in some historical properties in Australia. The Poinciana tree goes by many names. Scientifically, it is known as Delonix regia. Other names include flamboyan, the Royal Poinciana, and flame tree. Its uses are mainly ornamental which means, if you want a pop of color in your backyard, the Poinciana tree is the way to go. Besides having bright flowers and an excellent source of shade, the Poinciana tree grows very fast. The Poinciana tree growth rate is at least five feet each year. 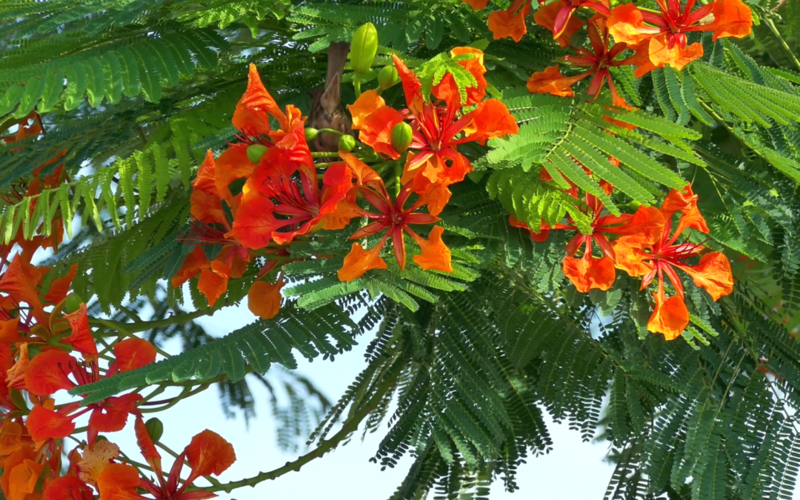 When you have a Poinciana tree in your home, you can expect a colorful canopy when the tree blooms. It is also an evergreen tree. Poinciana tree pruning is not a complicated process. It is, however, essential that you contact an arborist if you don’t know how to go about it. Careful pruning is essential since the tree is susceptible to problems like termites. Ensure that you prune your tree at the right time. When the branches die and fall off or break, they pose threats to the tree since it might die as well. Poinciana tree care involves feeding the plant to keep it healthy and growing. The first thing you need to feed it is water. Despite its adaptability, the Poinciana tree still needs a regular water supply. At a young age, the Poinciana tree requires water for its root system to grow healthy and provide a stable anchor for the plant. Also, part of the Poinciana tree care routine is regular inspection for pests and termites. Termites are a significant threat to the Poinciana tree. If you identify any pests, treat the tree to control the pest and termite spread. Poinciana trees have buttress roots that often extend to the surface. These roots are exposed to damage from cars if the plant is too close to the street or driveway. The more it blooms, the more claw blossoms you’ll need to clean from your compound as they fall off.